This was a really excellent challenge for March...so excellent that I ended up making it twice! The challenge was to make Dorie Greenspan's Perfect Party Cake, and we had lots of freedom in terms of fillings and flavors. The first cake I made was for my housemate's birthday. I followed the basic cake recipe, using Meyer lemons from our backyard. The cake layers didn't rise a whole bunch (it seems many folks had this problem), and we were expecting lots of folks at the birthday party, so I made another set of cake layers, eventually ending up with a super-tall cake! I filled it with lemon curd and ginger-infused whipped cream, and frosted the cake with more of the ginger whipped cream. 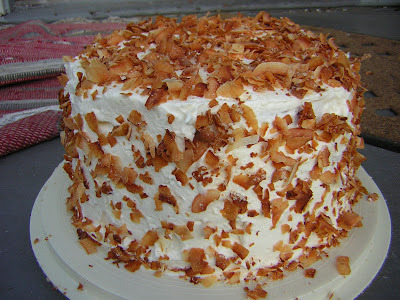 I then covered the cake in unsweetened coconut curls that I toasted in the oven and then tossed in sugar. It fit in perfectly with the tropical theme of the party and was enjoyed by all! Unfortunately we didn't manage to get a shot of the inside because it got gobbled up much too fast! Then, at home for spring break, my mom and I decided to bake the cake again for my uncle's birthday dinner. This time, we couldn't find any lemon extract at the store, so we substituted orange extract and orange rind in the cake for a lovely orange-scented cake. These layers rose much better, perhaps because my mom had on hand the type of cake flour Dorie recommends (Swan's Down, as opposed to the Soft-as-Silk I had used in my first try). 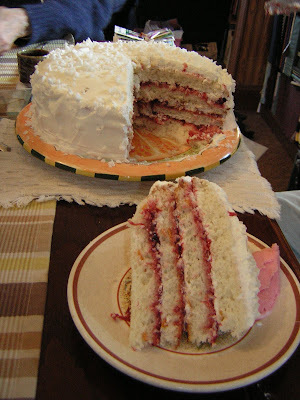 We split the layers and filled the cake with raspberry-rhubarb preserves and vanilla whipped cream. 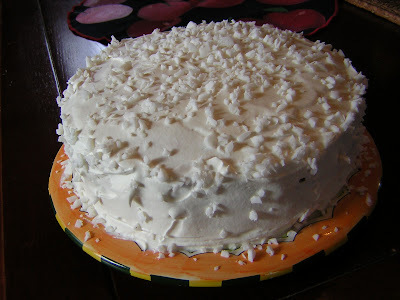 We frosted the cake with the remaining whipped cream and then sprinkled the cake with fresh coconut, ground up in the food processor. I used whipped cream in both of my cakes, which I thought was yummier than a buttercream (of course, I didn't taste both!). The vanilla whipped cream just involved a little vanilla extract. The ginger whipped cream was a little more complicated but definitely worth it. My housemate Jessie made a ginger simple syrup by boiling water, sugar, and chopped ginger until slightly thickened, and then strained it. We chilled it, which helped it thicken up even more. We added a healthy measure of simple syrup to the whipped cream until it tasted sweet enough (but not too sweet!) and then added in tons of grated fresh ginger until the cream was sufficiently gingery (it did get more gingery in the fridge before we ate it). In both cases, I made the whipped cream pretty thick so it would spread well and hold the cake layers together. Peanut butter and milk chocolate are one of my most favorite combinations, so I jumped at the chance to make this recipe from Cupcakes! They were tasty, although I would tend to call them more of a muffin in terms of texture--they were a little drier and denser than I was expecting. The frosting was good but nothing to write home about...I think if I made these again, I would use my standby chocolate frosting recipe and replace the bitter/semi/unsweetened chocolate with milk, to see how that turned out. 6 T butter at room temp. 2. Sift flour, baking powder, and salt in a medium bowl and set aside. 3. In a large bowl, use the electric mixer on medium to beat the butter, peanut butter, and brown sugar until smooth and lightened, about 1 minute. Mix in the egg and vanilla, and beat for 1 minute, until smooth. On low speed, add the flour in 3 additions, alternating with 2 additions of the milk. Mix just until the flour is incorporated and everything looks smooth. 4. 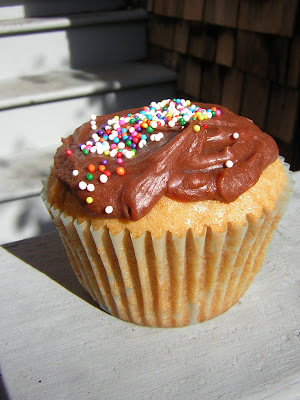 Fill each cupcake liner with a generous quarter cup of batter. Bake until firm and lightly browned, about 22 minutes. Cool 10 minutes in the pan. 1. In a medium saucepan, heat cream and butter until hot (about 175 degrees or when tiny bubbles form--not boiling!) Remove from heat, add chocolate, and let sit 30 seconds. Add vanilla and whisk until smooth. Let sit at room temperature until thick enough to spread on cupcakes. Cupcakes can be covered and stored at room temperature for up to 3 days. This was my first attempt at solo-whole wheat bread baking. 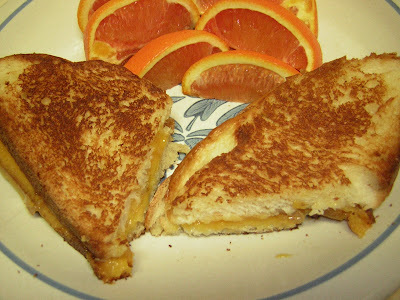 It was tasty, but two loaves proved to be a bit much as it was pretty hearty. I think next time I would freeze or give away one of the loaves. I liked the bread, although I found it a little dry...I think I like a bread with a little fat in it (this has only got fat in the glaze on top). It was certainly fun to knead though, and in any case more delicious than grocery store bread. 1. Combine warm water, honey, and yeast in a large liquid measuring cup, stirring until yeast dissolves. Let stand until foamy, 5 minutes. 2. 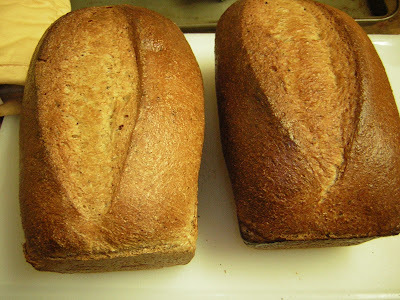 In a large bowl, whisk together 4 c bread flour with all the whole wheat flour, the wheat germ, and the salt. Make a well in the center and pour in the yeast mixture. Stir with a wooden spoon until combined. 3. Turn out the dough on a lightly floured surface. Gently knead in the remaining 1/2 bread flour a little at a time until the dough is smooth and elastic, 10-15 minutes. Place in a lightly oiled bowl and cover with lightly oiled plastic wrap. Let rise until doubled in bulk 1 to 1 1/2 hours. 4. Preheat oven to 400 degrees. Brush 2 9x5 loaf pans with oil. Punch down the dough, then turn out onto a lightly floured surface. Divide in half. Flatten one half into an oval the length of the pan and roll up lengthwise, gently pressing as you go to form a tight log. Place the log, seam side down, into a prepared pan. Repeat with remaining dough. Cover load pans with oiled plastic wrap and let rise until doubled in bulk, 30-45 minutes. 5. Using a sharp knife, slash the loaves down the center to make one long slash. In a small bowl, beat the egg yolk and cream together, then brush over the tops of the loaves. 6. Bake until deeply golden brown, 50-60 minutes. (If they brown too fast, cover with tin foil.) Transfer to wire rack and let cool 5 minutes; then turn out loaves and cool before serving. 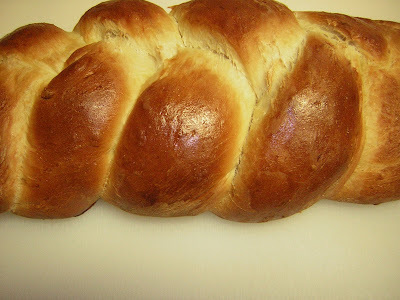 After my success with Julia Child's French Bread, I decided to try my hand at Challah. I was looking for something buttery and delicious, but perhaps not so buttery as the brioche my mom and I made over Christmas. This recipe from Mollie Katzen fit the bill perfectly. It has hardly any butter or eggs, but still manages to taste tender and eggy and buttery without being too rich. How does she do it? I guess it is magic. The best part of this bread: it does not take 7 hours to make! The second best part is that it makes a huge amount of bread...at first we thought it would be waaaaay too much, but somehow we managed to eat both enormous loaves in about two days. Yum! 1. Place water in a large bowl. Sprinkle in the yeast. Beat in the sugar or honey, butter, 2 eggs, and salt with a wire whisk. 3. Punch down the dough and turn out onto a floured surface. Divide in half, and knead each half for about 5 minutes, adding flour if it gets a little sticky. Divide each half in thirds, roll into snakes, and bread. 4. Lightly oil two baking trays and place a finished braid on each. Cover with a towel and let rise another hour, until doubled in bulk. Meanwhile, preheat oven to 375 degrees. 5. Bean the remaining egg in a small bowl. Brush a generous amount over each braid and sprinkle with seeds, if using. 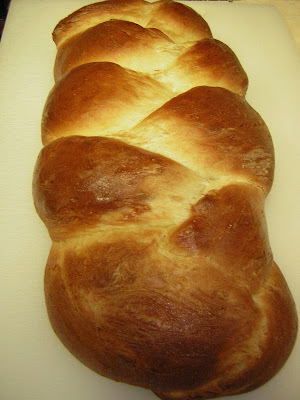 Bake 40 minutes or until the braids give off a hollow sound when thumped on the bottom. Cool on a rack 30 minutes before eating.